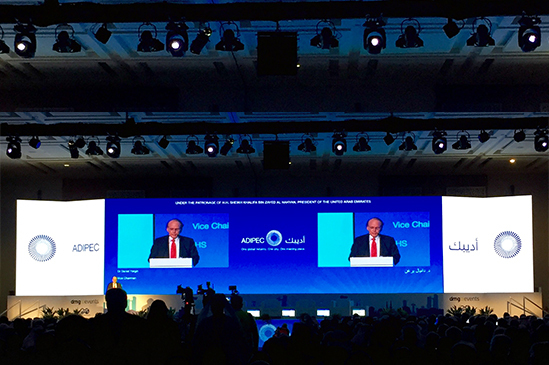 The oil industry is undergoing one of the biggest transitions in its history, requiring governments and private companies to make huge adjustments, the Minister of Energy Suhail Al Mazrouei said at the opening of this year’s ADIPEC conference in Abu Dhabi. “These are turbulent times for world energy,” said Daniel Yergin, the author of The Prize, one of the most widely read histories of the oil industry, in a keynote speech. Echoing Mr Al Mazrouei, Yergin / who is also the vice chairman of IHS, a Washington-based consulting group; said that the sharp price slide and the move from relative price stability over the previous four years to a period of volatility reflects a big overhaul in the world energy order. Mr Al Mazrouei noted that the UAE’s investment plans are continuing, even if its national oil company is looking for costs savings on its projects. The relative health of the industry in the region was reflected in the fact that the ADIPEC conference had surpassed this year’s OTC conference in Houston as the largest industry gathering in the world, with 2,050 exhibitors. UTS is proud to be one of those exhibitors, with its annual significant participation. “The vision of the UAE and of the region to continue as suppliers to the world,” the Minister confirmed. “We are not cancelling our projects. “I am confident we will see in 2016 some improvement in the market,” he added. Mr Mazrouei also said that the upheaval in the world oil market is an opportunity for countries to reform.